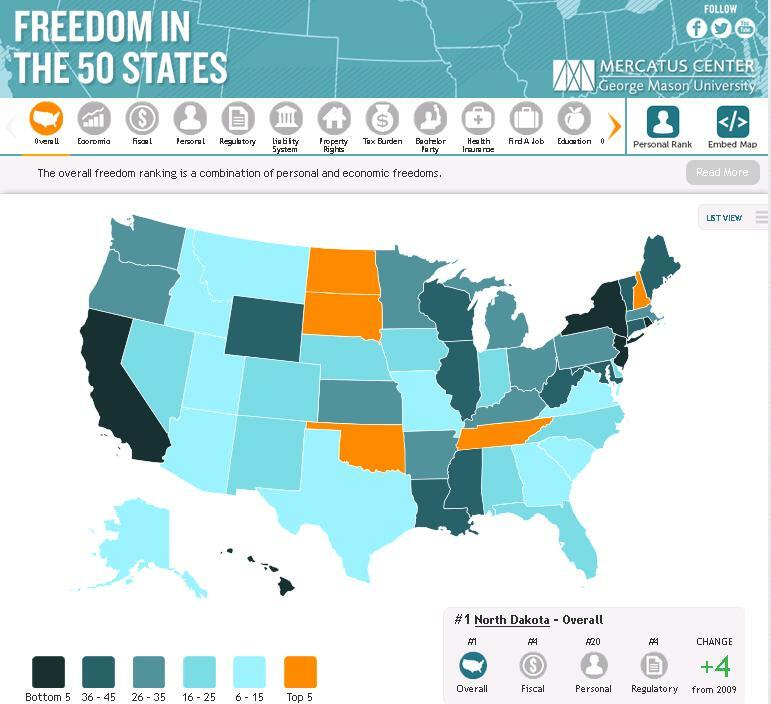 Over at NRO’s Corner, Veronique de Rugy draws attention to the Freedom in the Fifty States Index just released by Professor William Ruger and Jason Sorens. Professors Ruger and Sorens have a companion column on the index in USA Today. The index ranks states based on public policies affecting economic, social, and personal freedoms (e.g., bans on trans fats and the audio recording of police, licensing laws, taxes, mandated family leave, etc.). Ms. de Rugy points out that the site provides the ranking for each state as well as the methodology along with videos for every state and a tool to build your own rankings based on preferred freedoms. It’s no surprise to find that California and New York come in at numbers 49 and 50. They’ve worked hard to earned their positions at the bottom. Minnesota comes in at number 34, down two from 2009, which seems about right. Superliberal Democrat Mark Dayton became governor in 2010 and Democrats retook the legislature in 2012. I would guess that Minnesota is number 34 with a bullet headed down, but we have a lot of competition. It will be difficult to keep up with the Cuomos and the Browns. Looking on the bright side, we find that we have great neighbors. North Dakota and South Dakota sit at numbers 1 and 2 in the professors’ freedom rankings (followed by Tennessee, New Hampshire and Oklahoma). In Minnesota we could learn a lot from our neighbors. We could even learn from Wisconsin, which comes in at number 38 (also down two since 2009). As the authors note of Wisconsin, “this is one state that may already be improving due to legislative changes since the data cutoff for this study.” In Minnesota, however, we have no such prospect and recovery will not begin until we admit that we have a problem. UPDATE: The New York Post covers the index in “New York is the Nanny State with the least freedoms: National study.” As for California, I’m sure there is much more where this came from.